There was a time—years ago, you may not even remember it—when people looked to the Honda brand for fun. For performance. For screaming VTEC revving and razor-sharp handling and, through it all, affordability. Then the boringness and the earthquakes came. 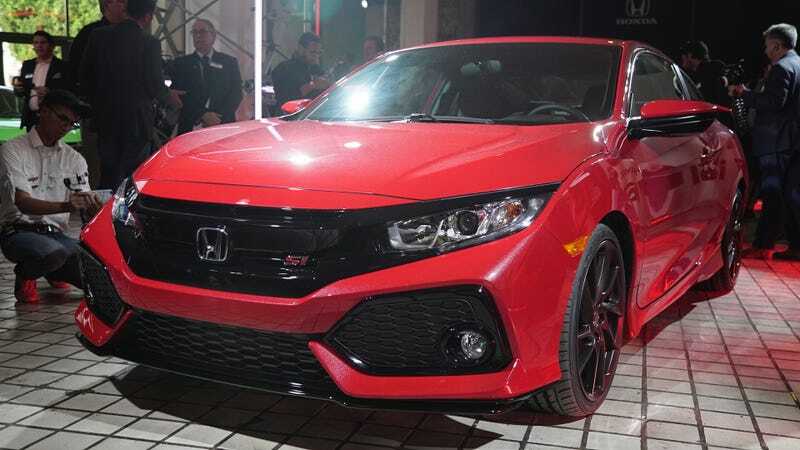 But now Honda wants speed-people to know it’s back with stuff like the NSX and Civic Type R. For those of us with less to spend, here’s the next Honda Civic Si, and it looks rad. Honda unveiled the new Civic Si Prototype today at a special event near the LA Auto Show, which kicks into high gear tomorrow. In Honda parlance, Prototype means “concept car that’s very close to the real thing,” same as the Civic Type R, NSX and various Acuras before it. Most of the details—including the wheels—of this prototype will carry over to the production version, Honda said. It features a 1.5-liter turbocharged four with a limited-slip differential, a tuned suspension, active dampers and direct adaptive steering. Honda promises it will be the fastest Si-badged car ever. We were expecting it to use a 2.0-liter turbo four, like a detuned Civic Type R engine, but it seems Honda’s going smaller. No word on power yet. A six-speed manual is the only gearbox Honda mentioned; let’s hope it stays that way. Using the generally excellent current Honda Civic as a platform, it should provide a great balance between everyday livability and absurd, knife-edge backroad heroics—not to mention plenty of options for the tuners. Hey, Honda’s doing fun stuff again! There’s a reason to get out of bed in the morning.